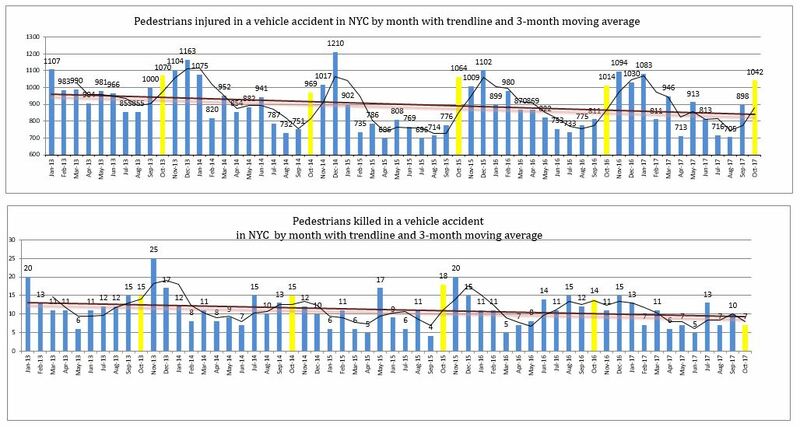 Because they have no protection when they get struck by a car, pedestrians are the most at risk of dying in NYC crashes. The Vision Zero campaigns to protect pedestrians have led to a decrease of pedestrian deaths over the last 4 years. In October 2013 15 pedestrians, 2 cyclists and 6 motorists died in crashes. Last October 7 pedestrians, 1 cyclist, 1 passenger and 6 motorists died in fatal auto accidents. Over the last four years the number of pedestrian deaths decreased by half while the number of motorists deaths remained stable. 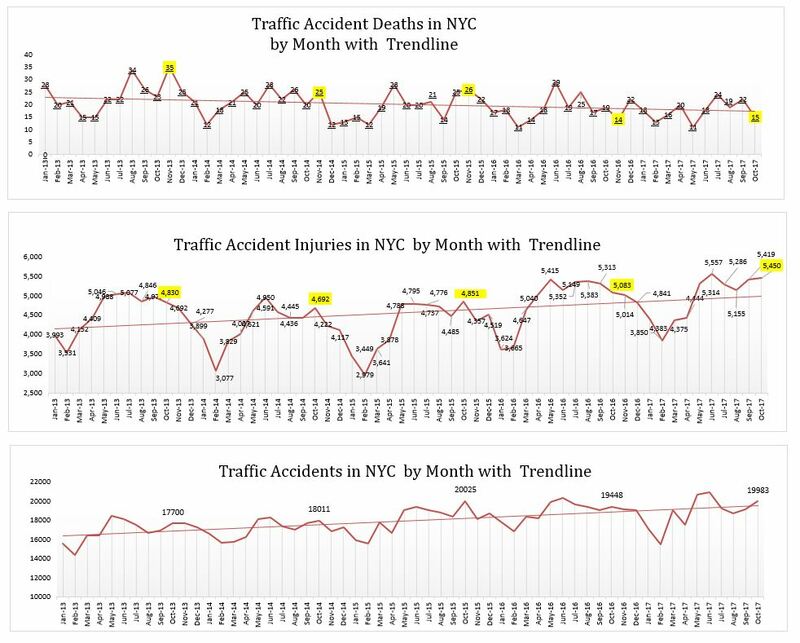 While pedestrian fatalities have been declining significantly since 2013 for the month of October, pedestrian injuries after declining to 969 in 2014 went back above 1,000 for the last 3 years. The global trend of pedestrian injuries is still declining though. 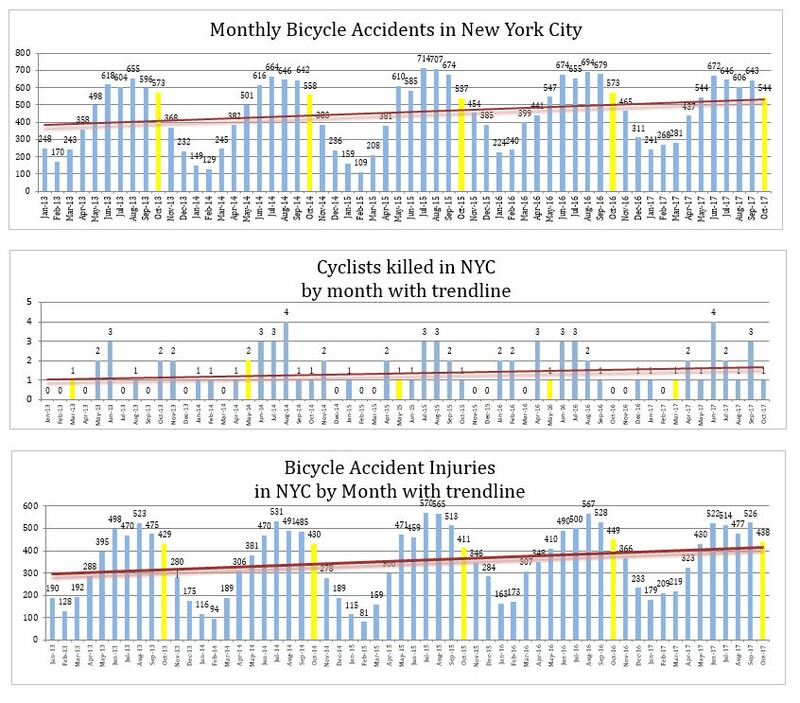 438 cyclists were injured and one of them died in 544 NYC bicycle accidents last October. Bicycle accident as well as deaths and injuries related to them are all on a rising trend in New York City. As more and more New Yorkers are using bikes to commute more and more of them are also getting involved in accidents. While multiple bike lanes have been implemented in the city since the beginning of Vision Zero in 2014 it is still a challenge to ride a bike in the city. After declining from 218 to 190 between October 2013 and October 2014, motorcycle accidents rose to 230 in October 2015, 263 in October 2016 and 289 in October 2017. The high number of accidents last October may be explained by unusually high temperatures. As summer temperatures continued well into October, bikers continued to use their bikes and to enjoy the Indian Summer leading to a higher number of accidents than usual in October. Truck accidents continue to be a major concern in New York City. Their number went from 635 in October 2013 to 1,528 in October 2017. Factors that can explain this increase are the recent boom in the construction industry as well as people ordering online and getting their shopping delivered at home instead of going to the store. Bus accidents are also on a rising trend. 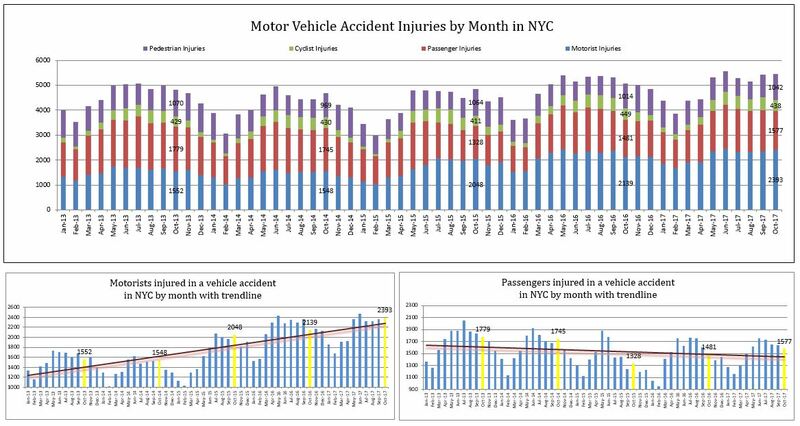 Bus accident data are very volatile from one month to the other and awkward to read. However despite its awkwardness the graph shows that May and October are always the worst months for bus accidents. Last October 732 accidents were reported compared to respectively 642, 726, 698 and 680 in October 2016, 205, 2014 ans 2013.